Participate in research that triggers a donation to a charity, such as the type of research Op4G does. When you join the community and contribute to the research, you get a little something but you can also direct compensation to a charity of your choosing. There are numerous organizations that need things that you may have extra of and want to get rid of. For example, your old blankets and towels that you no longer want would be appreciated by your local animal shelter. Clothing that you don’t wear anymore or that your kids have outgrown could be a blessing for a domestic violence or homeless shelter. Furniture or building materials that you don’t need anymore can help Habitat for Humanity either in their ReStores or Habitat houses. Most organizations would like your time as much as your money. Pick a cause and see what they need help with, then give your time and talent to them. 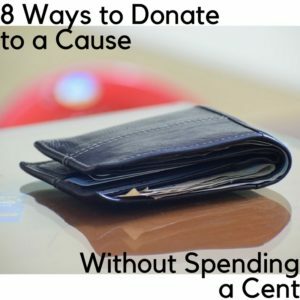 Similar to volunteering, you can become a fundraiser for an organization. Whether that’s organizing a walk team, selling goods or tickets for them, etc you can help raise money that way. Lots of times public figures will let their fans determine where they donate their money. Right now, a pitcher for the Cleveland Indians, Trevor Bauer, is letting his fans submit their favorite charities to his 69 Days of Giving. Do you order a lot of things on Amazon? Shop through Amazon Smile to have a portion of your purchases donated to your favorite organizations. Choose to shop online or in person at places that donate part of their proceeds to a cause you support. You can also attend (or host) fundraising parties with home sales organizations like Premier Jewelry and others. You can earn points through almost anything you do, whether it’s traveling, shopping, taking surveys, etc. Some of those loyalty programs will let you donate your points to a cause rather than redeeming them. I get a lot of free stuff, whether it’s samples in the mail, goodies packaged in with something I’ve bought or offers for things I don’t need (like diapers). Take those freebies and put them to good use by giving them to an organization that could use them. Even things like the little hotel toiletries can be appreciated, the Ronald McDonald room at the children’s hospital accepted donations of toiletries for families that were unexpectedly at the hospital with a child an needed to clean up. The former executive director for a charity I used to volunteer for once told me that there were three things you can donate to an organization – your treasure, your talent, your tribe – and any of them will help. How do you support the causes and organizations that are nearest and dearest to your heart? This entry was posted in Community and tagged charity, donate, fund raise, fundraise, Money, Op4G, sponsored, sponsored post, volunteer by Rachel. Bookmark the permalink. I love these ideas! So many ways to give back!